Torbjörn Blom´s Projects: House foundation done. There have been so much happening with the house that I have had no time writing on the blog. But here is a update on what is happening at the building site. Groundwork is done and all the rough planing of the garden is done. The excavator has left the site and should be done. The edge elements are in place and the Styrofoam insulation is also in place. The reinforcement is going forward and should be done in the end of the week. 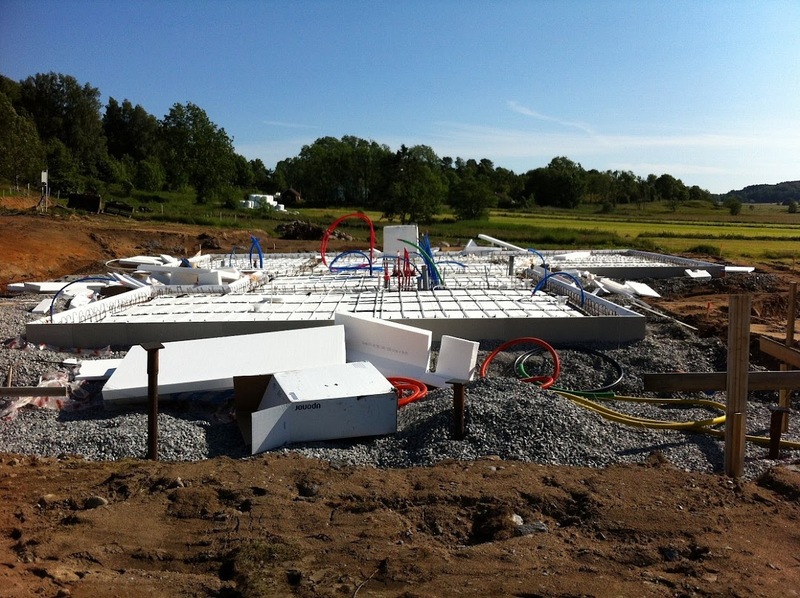 All the plumbing that will be in the concrete slab is in place. So we are getting closer to order the concrete truck and pour the the concrete slab. To get this far have we been forced to work on the site and help the builders. When we took the decision that we need a piled foundation for the house was there allot more than just put the piles in the ground. The concrete slab needs to be much more reinforced and and have more reinforcement bars. Here is where the problem came. The company that usually makes the reinforcement cages for HM-house had to much to do. So it was up to the building team to make all the reinforcements and bend the reinforcement irons. I heard that this will cost us more money because it takes allot of time. So I and Helena and my dad set to work to bend 411 U-shaped frames and 225 V-shaped frames for hand. 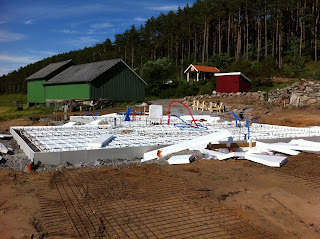 But we had the time and I am glad that I can help the builders and speed up the process. I am also glad that I do not have a gym-card because that would be a wast now. I get more then enough exercise from this work. Step 1: Cut the reinforcement bar in 6 pieces. I have also helped the excavator build the stone wall around the entrance and the car-parking. I am very pleased with the result. It shapes the entrance and we get a good surface for guests to park there cars. Here are some pictures. The sewage system is also finished and put down in the ground. No I need to fill it with pup and see if it works properly. It not much that is visible after the builders have done there work. Then we will add some plants to hide the big white box. 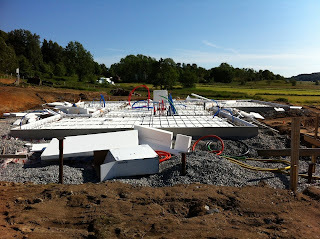 Next thing that will happen is the big pour of concrete and that will take place in the beginning of next week and after that will they start to rise the outer walls and the roof. So if we are lucky will the outer frame be done before the summer vacation. But I do not believe that before I see it.